Well I managed to find myself a Revell 109G at half price during the swap and sell over the weekend, but unfortunately I was unable to find any decals, so the exact aircraft is still to be decided, but the Revell kit looks pretty nice. I may do a JG 300 Wilde Sau aircraft, or if I can find them, the Finnish used the G-6 as a night fighter post war. Good choice Brad, I'll enjoy watching this build but don't forget those awful weak undercarriage legs!! Ooh.... this is going to be SO interesting to watch. Will follow with delightful enthusiasm..
Oh really? Thanks for the heads up on that. Excellent choice Brad. Nice kit too. Look forward to the build. 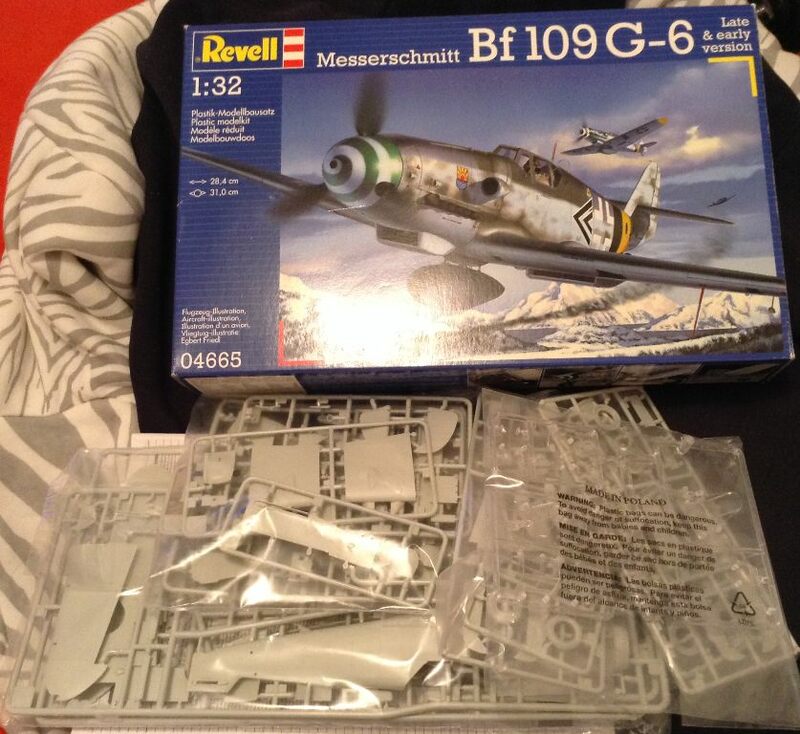 I've decided on a colour scheme, it shall be yellow 7, a Bf 109G-6/R3 of 1/JG 300. I couldn't find any decal sheet but figure the 7 is easy enough to paint on. The rest of the markings look pretty stock standard. I'd say a yellow cowl under and rudder too that have been kinda roughly overpainted with black. Nice choice Brad. A 109 is always welcome but which camo? From the profile it seems a strange worn out white camo. Well it's a cold old night here in Melbourne, I have the cricket on so decided to crack open a cold one....and a model. So far so good, the beverage was something I picked up from Aldi, not bad, good enough to warm you up a bit though. I'd say it's RLM 74/75/76, RLM 04 rudder and lower cowling with a RLM 66 grey windscreen and canopy with black roughly sprayed over the markings and lower surfaces. I agree with Brad, note the rear canopy part is not RLM 66. Can't tell really for any yellow but maybe this is from another source apart from this photo. Nice choice Brad. looking forward to following along. 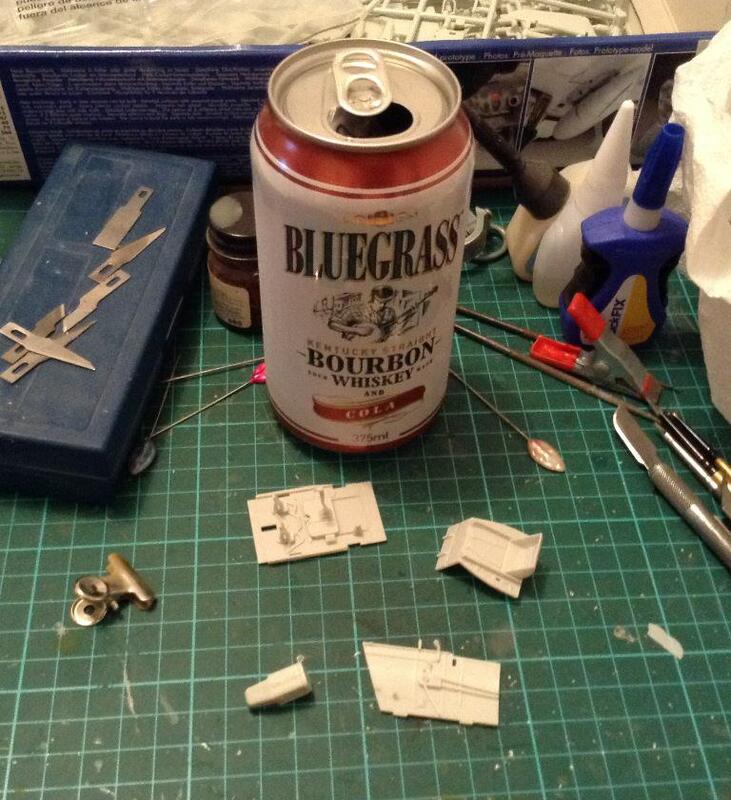 Some more minor construction, the clamped part is a section of tail wheel. The exhaust stacks are in and I've cut out and cleaned up all the cockpit sections which are awaiting some paint, but I can't be bothered tonight, the cricket is about to start! Also I don't know why Revell wasn't able to engineer their kit to accept the exhaust from the outside, it would have made painting and weathering much easier. There's a few odd things on this kit like that. Good start Brad. It feels odd having all of that open engine cover off on the fuselage halves. You would think that would lead to all sorts of cowl and gun cover fit problems VS just making the fuselage whole, and possibly making some inside weakened panel lines for the cowl instead. Looking forward to some more progress! I think they were looking to maximize the amount of variants they can make from one mold. They do give you a fair few parts to do an early and late G-6, could probably make a G-14 out of the parts included as well. 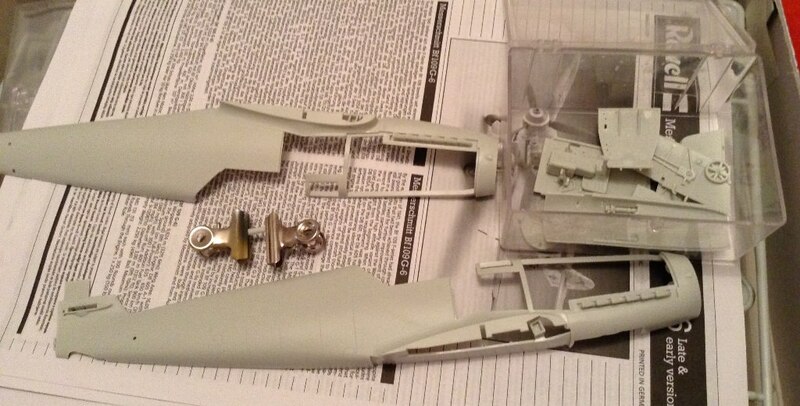 I had no issues with the landing gear, and nearly two years later it is still standing pretty on my shelf. But that of course is but one opinion.